Money Saving Tips for Halloween. Let’s recycle…. 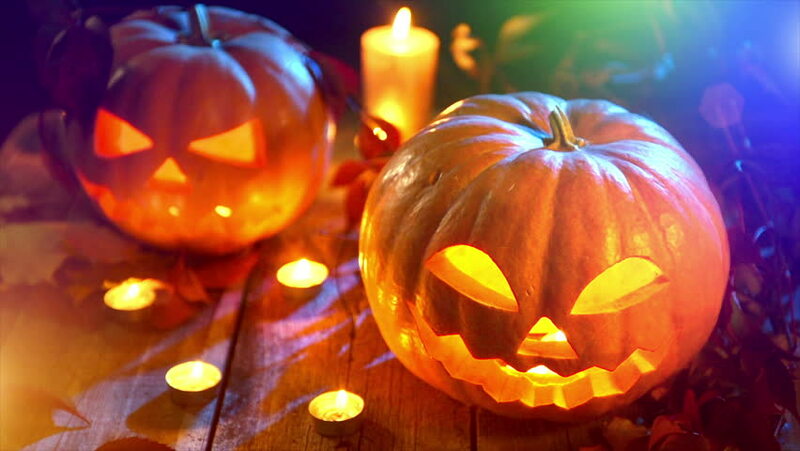 Halloween is looming and so is the much awaited annual Halloween party. Panic sets in when you realise you don’t have a clue where you’re going to buy your outfit from so you stand out and look original. Whilst considering this and also taking into consideration the impact on the environment, the worst option would be for you to go out and purchase an outfit that you’ll only wear once then bin it! Why not consider wearing something that’s been used before? I’m not talking about your Uncle John’s pre-worn Frankenstein outfit from 1993, I’m talking about something that has had a use before. It’ll also save you money, too. Over the next week or so, when using household products and sorting out your waste, consider collecting bin bags, tins, glass jars and recycled paper or card. You could be really creative and make an outfit out of these so that you stand out and look unique! 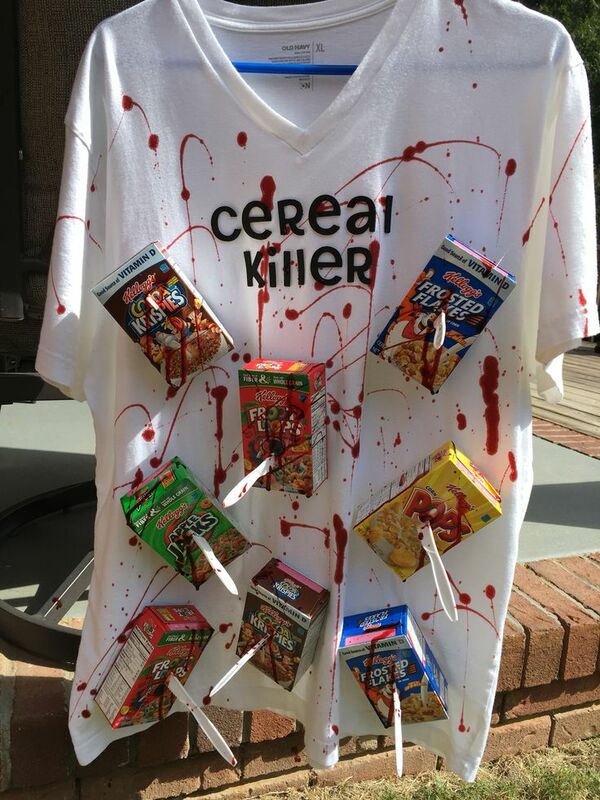 For example, Instead of throwing old cereal boxes away, try sticking them on to yourself with some fake blood added and become a cereal killer! Whatever you decide to do this Halloween, consider the impact you are making on the environment. Do you really need to make that quick trip to the shops when what you’re looking for could be right under your nose at home? Cheap, resourceful and spooky Halloween decorations! Big stores often sell poor quality goods that can be harmful to the environment and expensive because the demand is high at this time of year. They then get packed away for another year or thrown away! The items you buy from the shops can often be cheaply made from plastic in a factory far away with very unethical working conditions. Creating your own Halloween decorations, from your own recyclable items with help from the children prevents you paying high retail prices and may be the way forward! 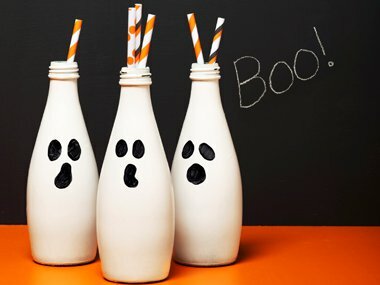 As the vast majority of children enjoy Halloween, making DIY decorations can actually be a fun activity to do with them. 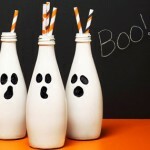 Try these Boo bottles as a fun exercise! To create this, you would need to raid the glass recycling bin. Firstly take off any labelling, caps or lids from the bottles. Then colour them with white spray paint. Draw faces on them with a black pen along with any other decorations you or your children wish to add. You could even add some straws, for greater effect. If you are looking for something quite cheap, dazzling and terrifying this Halloween, what about this spooky decoration! 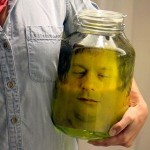 This is literally a photograph on card inside a jar made to look like a head! This decoration will surely spook any trick or treaters, is environmentally safe with minimal costs. Imagine your neighbours face when he sees this through his window! If you want to know more about how to make this then click on the website link below. * Vampire napkin rings – This can look scary! Splash some fake blood or red kool-aid on a white cloth. Then thread a white twist tie into a set of plastic white teeth. Then, at the end, place a twist tie through the centre of the napkin. * Bat Garland – make your own bat creatures with black tissue paper. Draw your bat outlines across a full batch of folded tissue paper the cut through the outline! * Jack-o-lantern – Inside some clear and clean jars add some tissue paper or orange construction paper. 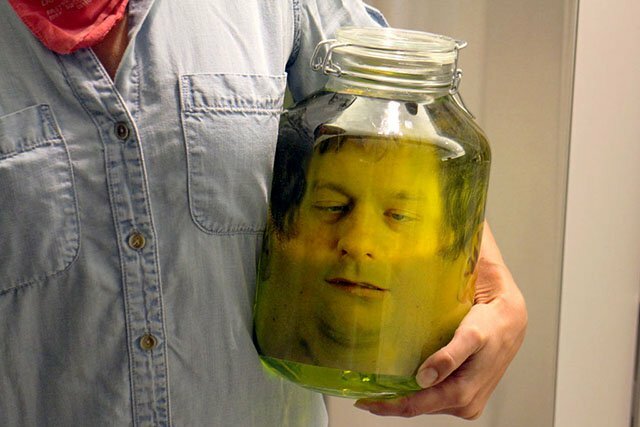 Then put some additional facial features on the outside of the jar with black tissue paper. Add a tea candle, with flames, on top and see your homemade spooky pumpkin glow! 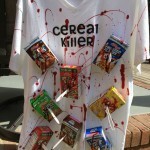 There are many other scary Halloween costumes and decorations that can be made at home that we haven’t mentioned. The creativity can be endless! Aside from saving the environment and encouraging recycling, you save money and you might actually enjoy doing it yourself. Try it! If you want to know more interesting facts about recycling visit one of our previous blogs 10 Facts About recycling!